The versatile 1/4-inch ratchet . . . The ratchet and socket set is the most critical component of your tool kit. It’s what comes out when things need attention that are held on to the vehicle with actual nuts and bolts, rather than just trim screws or plastic press fittings. Important things, in other words. I’ve always maintained it’s the part of your kit you should spend the most money on, to get the absolute highest quality. Of all the tools I’ve broken over the years, the majority by far have been cheap sockets that split, or cheap ratchets that jammed or broke altogether. Most owners—me included—start out with a 3/8ths-inch ratchet and socket set (the 3/8ths refers to the diameter of the anvil, the square peg on the ratchet to which you attach the sockets). A 3/8ths set will comfortably handle bolts or nuts from about 9mm or 5/16ths inch up to 19mm or 3/4 inch. That’s suited for a lot of medium-sized repairs—replacing fan or serpentine belts, water pumps, radiators, etc. Above that you really should step up to a 1/2-inch ratchet, which is able to handle larger sockets for fittings such as those on suspension components, which need more torque to remove or fasten securely. Thus for a long time my automotive tool kit has included a 3/8ths-inch ratchet and socket set for general work and a 1/2-inch set for major repairs. And that worked just fine. But lately I’ve been rethinking. Why? Several reasons. Even a 3/8ths ratchet can be a bit long and bulky when working in tight spaces on fasteners smaller than 11 or 12mm. Yes, you can add a short-handled ratchet to the kit, but the head will still be just as bulky. And your 3/8ths socket set will probably have a lot of overlap with your 1/2-inch set. Typically the former will include sockets up to about 19mm, and the latter will include sockets down to 12mm. I’d rather use a 1/2-inch ratchet for that 19mm nut, yet a 1/2-inch ratchet is silly overkill for any 12mm bolt or nut I’ve ever encountered. Enter the 1/4-inch ratchet. It’s smaller all around, able to fit into spaces no 3/8ths equivalent could. 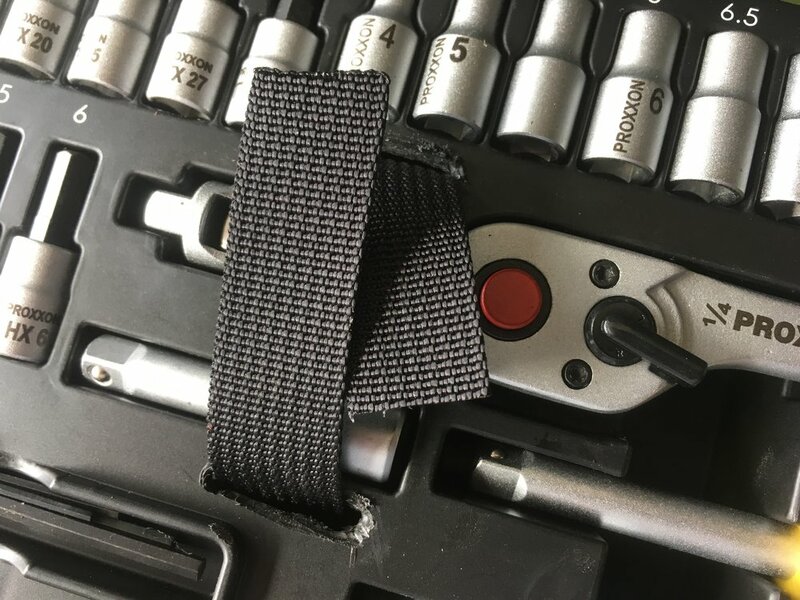 You can argue that the ratcheting mechanism is inevitably weaker as well, but consider two things: First, there is only so much torque necessary for even a 12 or 13mm fastener; second, a high-quality ratchet will withstand force comfortably in excess of any you’re likely to need. I’ve yet to meet a 12mm or even 13mm nut that I couldn’t remove with a 1/4-inch ratchet. And it will be far handier for smaller sizes. Additionally, a 1/4-inch ratchet and socket set will cost less than a larger one, so you can go for higher quality. Finally, the 1/4-inch set will be lighter and take up less space, a surprisingly real consideration even in something such as our Troop Carrier, the tool bin of which is approaching maximum capacity and the GVWR of which is approaching, period. So I’ve been wondering if a versatile combination might be a 1/4-inch set with sockets ranging from very small, say 4 or 5mm, up to about 13mm, and a 1/2-inch set with sockets from 12 or 13mm up to whatever you like—my current set goes up to 32mm. The slight overlap would mean that if you ever did run into a recalcitrant 12 or 13mm bolt while using the 1/4-inch kit, you could switch up to the 1/2-inch. I have a nice mixed set of 1/4-inch stuff, but this scheme was a perfect opportunity to spend money on tools. I like investigating brands new to me, and my friend, driving trainer extraordinaire Graham Jackson, is fond of the German brand Proxxon, so I looked them up on Amazon, and ordered the 23280 49-piece “Precision Engineer’s” 1/4-inch drive set. The first thing that impresssed me was the box it came in. While plastic rather than metal, it had decent sliding latches rather than the usual flimsy snap latches with stressed-plastic hinges, which invariably fail. A nice touch. Inside I first examined the ratchet itself. The mechanism was a fine 72-tooth unit. Check. Push-button release, check. Lever-operated reversing switch, check. Perfect. The offset head is supposed to ease access to tight spaces. Not sure about that one. The selection of sockets was very good. Standard sockets from 4mm to 13mm—perfect. They’re forged from chrome vanadium with a double-nickel and single chrome layer finish for corrosion resistance. They of course employ a copy of Snap-on’s Flank Drive system to help grip rounded off nuts (and to avoid rounding them off). A bonus was a comprehensive selection of bits for either the ratchet or the included driver: Screwdriver bits, hex bits, and Torx bits. Five sockets for external Torx fittings. There was even a little selection of angled allen keys, 1.25 to 3mm. The set included two ratchet extensions—one of which included a (removable) sliding T-bar fitting—and a universal joint. The only flaw I found was the paucity of deep sockets—just four of them, in 6, 7, 8, and 10mm. Odd. Why not a full complement up to 13mm? I would have traded the external Torx sockets for them. As it was there was no space in the tray for additional sockets. But . . . what’s this? There appeared to be some voids in the box under the molded tray. Indeed, when I lifted it out there were several generous gaps. I called the U.S. Proxxon headquarters. They told me they don’t directly import the hand tools sets, only power tools (I bought mine through a third party dealer). However, when I told them what I was trying to do they generously offered to special-order the sockets I wanted. So I filled in the deep sockets and bought a flexible drive extension as well. All those plus a Snap-on flex-head 1/4-inch ratchet fit underneath the tray. I guess I need to clean up those holes. Now I had a comprehensive 1/4-inch socket and ratchet set with the bonus of the driver bits and handle. As expected, it was significantly more compact than an equivalent in 3/8ths. The last task was to make it easier to get the molded tray out when I wanted the stuff in the bottom. So I Dremelled two slots in the tray, and ran a piece of flat 1/2-inch webbing through them and under the tray, leaving the ends loose on top. It’s now easy to pull the tray free. Our Troop Carrier has a comprehensive set of tools, but they live in a cabinet under a bench that is somewhat of a pain to get to. I’ve been wanting to have a more convenient tool kit for small repairs and adjustments. This Proxxon set, with its combination of sockets and bits, should fill that role perfectly—and it’s compact enough to fit behind a seat. Hmm . . . I wonder if I should order another two or three sets? 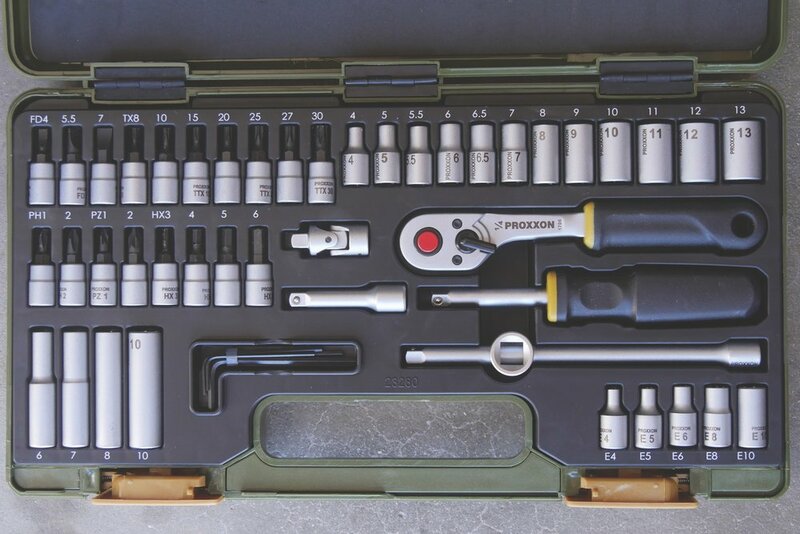 Epilogue: Regarding my idea that a 1/4-inch socket set combined with a 1/2-inch set might be all one needs for just about any job: Proxxon sells a kit (23286) that combines just that, with sockets from 4mm all the way to 34mm. Impressive. Just add some deep sockets and a breaker bar. Newer PostThe new Defender appears, sort of . . .